We're very fortunate to live in a city with great restaurants. The food scene has exploded over the past several years. 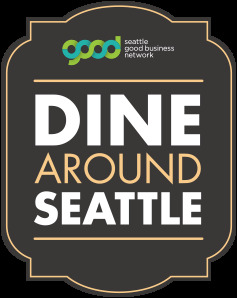 Last month was Seattle Restaurant Week and now in the month of November, it's the bi-annual dining event Dine Around Seattle! Participating restaurants off a 3-course prix-fixe dinner menu including appetizer, entree and dessert for only $33! 3-course lunches are offered at some restaurants for only $18! Just like Seattle Restaurant Week, Dine Around Seattle offers the opportunity to try out restaurants at a great price. Dine Around Seattle gives you an entire month to head out and try as many restaurants as you can. So make a list, loosen your belt and get eating! Dine Around Seattle takes place November 2nd - 30th, Sundays through Thursdays, excluding Sunday Brunch and Holidays. Went here for a great all-you-can-eat event and they held nothing back. I was starving and am one of those voracious "sampling" type eaters who has to try everything from event planning buffet, and I couldn't make it!